We are in love with Lithuania. There is a relaxed pace about the country that makes it easy to fall for. At the heart of the country is its capital Vilnius. This is our Valentine to Vilnius and one hotel in particular –the charming boutique Hotel Narutis. Riding down in the glass elevator beneath the impressive atrium of Hotel Narutis it is easy to imagine what this historic hotel would once have looked like when it was a 16th century merchant’s mansion. Once upon a time the lobby where the lift descends would have been a central courtyard, now it is a cosy main space with vibrant red velvet sofas and blush coloured walls that set the tone for the whole hotel. The hotel, a part of the LVX collection by Preferred Hotels & Resorts, was built in 1581 and its past shines through in restored frescoes, wooden floors and gothic vaults. Part of the hotel’s charm is that none of the 53 rooms and suites in this classically styled hotel are the same. Each has individual touches that makes them unique. 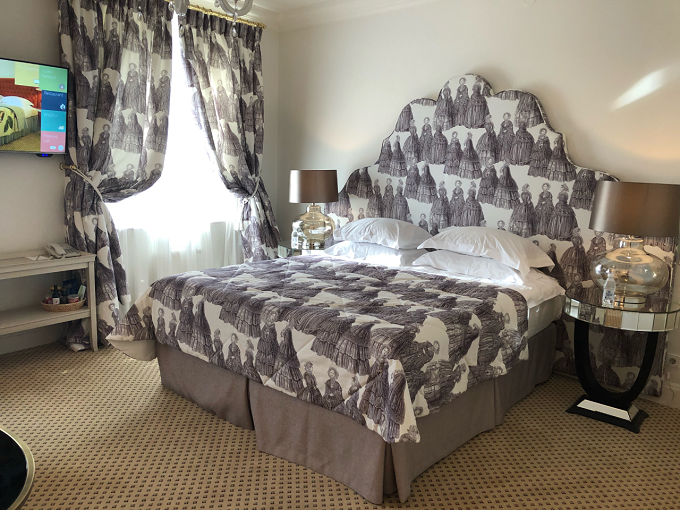 Our room was a sophisticated mix of soft grey and white tones with brass coffee tables and a chic monochrome pattern of crinolined ladies dancing over the fabric of the headboard and drapes. Other rooms have cherry red touches or wooden beams and wall paintings. However it is the warmth of the staff which stands out. As soon as we arrive a smiling doorman happily jumps into our car to help direct us down the tiny back lanes of the old town to the secret car park at the back of the hotel. He even manages not to wince at how close our car comes to the hotel gates or the old brick walls. It is a tight squeeze. What all this tells you is that Hotel Narutis is right in the middle of the old town, a perfect location for exploring the city. 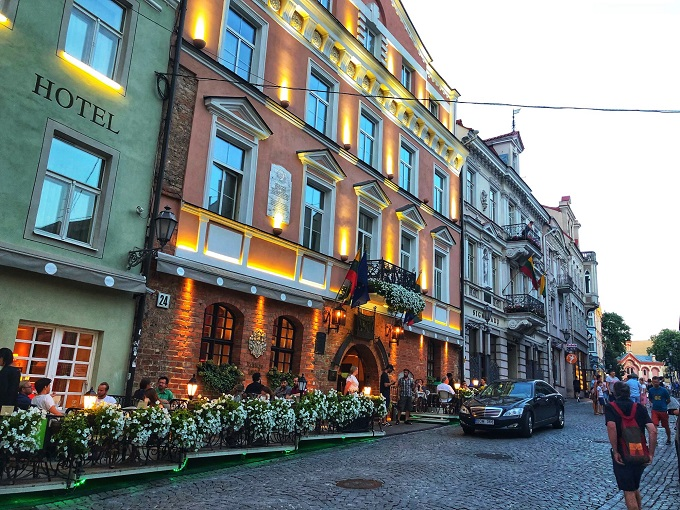 From its entrance you step right out onto cobbled streets lined with candy-coloured houses and baroque churches, yet the city’s wide main square and modern shops are only a short stroll away. For those who want to venture beyond Vilnius the hotel can organise a visit to the nearby Trakai Castle in style in a chauffeur-driven Mercedes Benz S-Class/ It’s a day trip worth taking, as the red brick castle sits in the middle of a tranquil lake dotted with sailboats and cruisers. After a day exploring Trakai we unwind in the basement spa with its vaulted arches and cascading water features. There is a steam room, Jacuzzi and small but perfectly formed swimming pool, ideal for a relaxed swim after a busy day. Massages and facials are also on offer. There is a lot going on in the basement of this hotel: the breakfast is served in the old cellars with low brick archways and a curved ceiling. Just make sure to duck as you head for the buffet table, the arches were made for shorter generations! In the evening the space transforms into a quirky cellar restaurant lit by candlelight. On our last evening we eat at the summer terrace outside the hotel. It is a popular spot. The terrace is packed with locals as well as tourists, dining on Lithuanian tasting menus. In winter the indoor a la carte restaurant is equally popular, serving up hearty soups and traditional cepelinai dumplings. However, on this warm evening we sit on the terrace with a glass of Lithuanian red and people-watch until the sun sets. 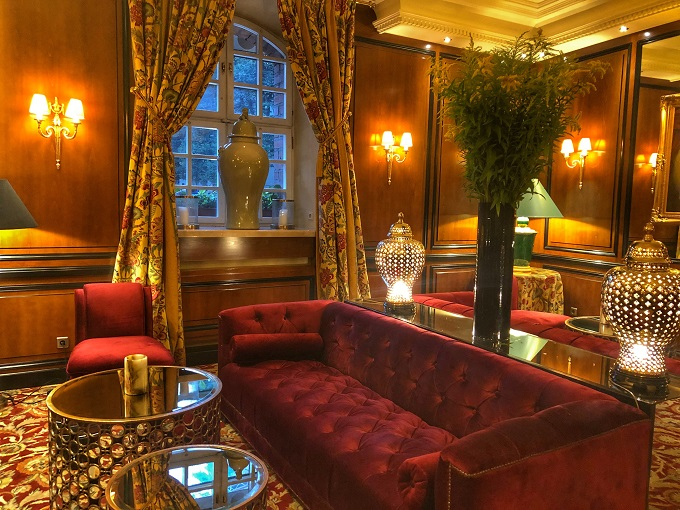 LUXURY HOTELS: The Willard Intercontinental Hotel, Washington D.C. LUXURY HOTELS: Watergate Hotel, Washington D.C.